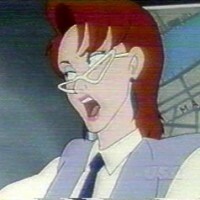 if If Egon didn't exist, who would be Janine's love interest? What if Egon Spengler didn't exist...in the movies or catoons? who would you like to see Janine have as a love interest if any? I would have to say my first pick would be Peter. Now don't misunderstand me. I'm 100% pro E/J but as I said at the beginning of my post lets pretend Egon doesn't exist. I can see Janine and Peter having one of those passionate love/hate relationships like Sam and Diane from Cheers. I definitely do not see her with Louis Tully despite GB2. a P/J pairing would be much more interesting. Post subject: Re: Janine and.....??? 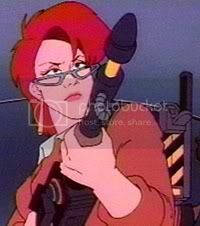 If Egon didn't exsist in the cartoons or the movies, her love intrest would be Ray. I'm also E/J all the way but if something happened along the way, I would say Ray would be a great choice for her. For a AU paring, I think they would look cute together. I agree re: Peter. I think they have an interesting chemistry. Really fun and jokey jokey. That is how many relationships start. Some of the jokes could even be misinterpreted as flirting. I'm all about the Egon & Janine, but if he was out of the picture then the only one I think who could be a match for Janine is Peter. She'd walk all over Ray and the Winston thing might be interesting but I think he would get aggravated with her after a while and she'd be bored to tears. I'm actually thinking of making a fanvid dedicated to the Peter/Janine dynamic -- nothing romantic of course! If in an AU situation under extreme circumstances Egon maybe were to die, I think his dying wish would be for the other guys to look after Janine & his mother. Winston is much more like a protective older brother to Janine & as such he would have to be very strong for her & the other guys too. I just couldn't see anything developing between them. Peter I think would want things to stay as normal as possible so I think he'd continue his sibling rivalry with her, to continue keeping her mind & tongue sharp & certainly he wouldn't even entertain a romantic relationship with Janine, especially since she was his best friend's girl. Ray is such a big kid and so much fun that I think he'd be the only one who would be able to make Janine smile again & as such they'd start to get closer & maybe fall for each other as a result. Anybody else isn't even worth considering!!! That's just what I've been thinking about recently anyway. In truth Ray's the only one I don't feel uncomfortable about Janine being with in an AU. I picked other, because I honestly don't think she'd have stayed with the ghostbusters past the Gozer incident if Egon hadn't existed. She stayed because of him, and every time she came back was because of him. She had a very thankless, job at Gb, in her own words she had quit better jobs, so I don't think she would have had a reason to stay. So she'd start some new crappy job and marry some guy she only thought she loved because she never had the chance to experience the true type of love that she feels for Egon, and she would just muddle through the rest of her life always feeling like there was something missing but never being able to put a finger on it. some very interesting replies here. Thanks. I voted for Peter. I would also like to reiterate that I, too, am a HUGE EGON/JANINE fan. It would also have been cute and interesting. Kinda like Gerard Butler and Katherine Heigl in the movie "The Ugly Truth"
I think the Peter cartoon was absolutely cute and actually had a crush on him! Hahaha! I voted other. In this case, the "other" meaning "no one". I don't see her and Peter, Ray, or Winston ever making sense, and supporting cast don't need subplots of their own. I said another character. I can't see her with any of the other guys and defiantly not with Tully.